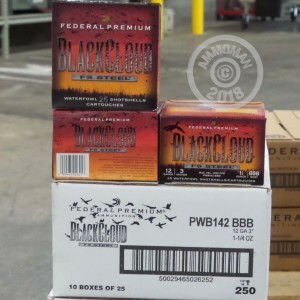 If you are looking for a great ammunition to accompany you on your next waterfowl hunt, this 12 Gauge Federal Blackcloud will make an excellent choice! These shotshells from Federal Premium's line of ammo have 1 1/4 ounces of steel BBB shot packed into a 3 inch shell. With a powerful muzzle velocity of 1450 feet per second, you will have no problem stopping your target mid-flight. Federal's Flitecontrol wad helps to keep your patterns tight, particularly in long ranges. Flitestopper steel shot pellets hit hard and are a great option for hunting near water. This ammunition is brand new production and will deliver the high quality results we all know and expect from Federal. Federal ammunition has been around for over 90 years. Based in Minnesota, Charles Horn founded the company in 1922. In 1977, Premium brand centerfire rifle and shotshells were introduced into the mix. Their reputation for consistently producing high quality ammo at affordable prices makes them a top leader in the ammunition industry.